Authenticity: The statue is signed "Hellsten Skruf" and has the original stickers "SKRUF Sweden" + label "Lars Hellsten Form" on the back. Dimensions: 8 cm height, 8 cm wide and 4 cm thick. Proposed statue for sale, ie a crystal figurine of a Viking, it is made by Lars Hellsten, a known and acknowledged master of glass and crystal design, being made for Skruf Glassbruk, Sweden, in the '60s. The design is stylish, innovative and modern - the geometrization of forms. A drawing vigorous, strong, inspiring force and strength, a design line that characterizes the entire work of this Swedish artist. 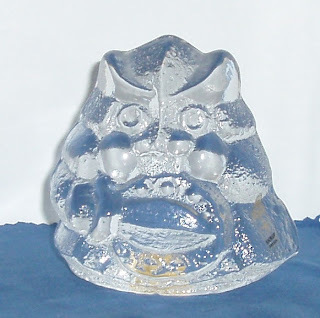 The technique used is mold-blown, or blown crystal In an mold, to obtain the shape and texture. However, a rarity and a true work of art, taking into account the fact that Lars Hellsten worked Skruf only 6 years (1964-1971) has not allowed him to keep the offer from Orrefors not refuse to artist . And Orrefors do not hire anyone! Lars Hellsten (b. 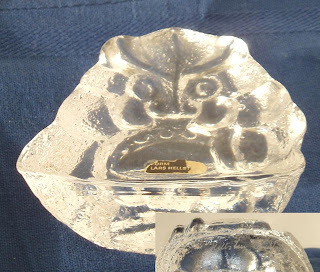 1933) studied sculpture at the Academy of Arts, Crafts and Design in Stockholm, working then as a designer, the "Skruf Glasbruk" (1964-1971) before coming to Orrefors in 1972 - where he worked over 30 years. It is considered a legendary designer and an artist in the field. Nature, the elements of nature and inspired, in most cases, works of art glass. This includes several large pieces, well suited to public spaces. 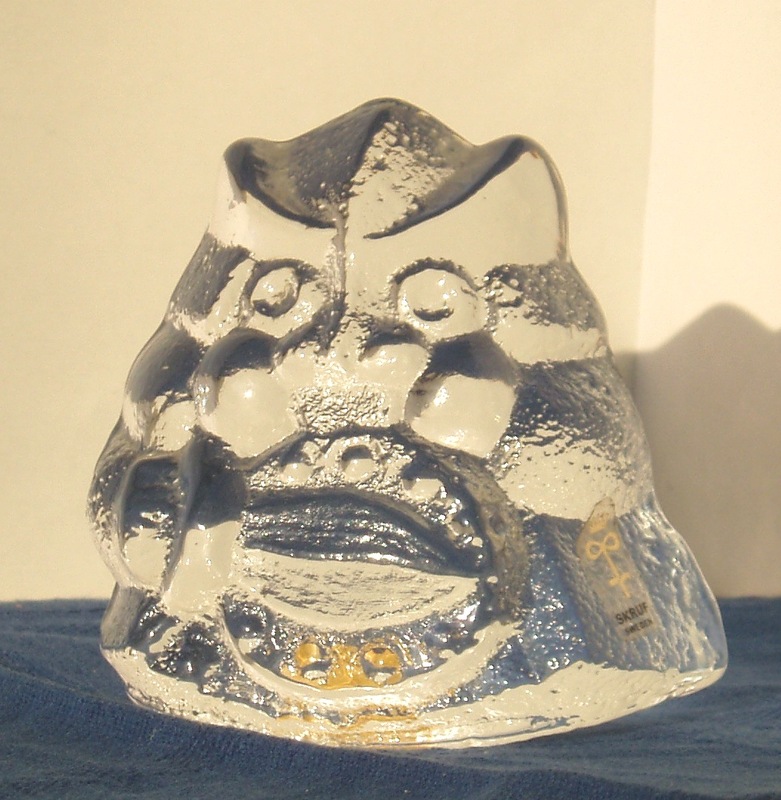 His pieces, crystal or glass, are the main characteristic strength (massive) and power, be it glass cast (cast glass), blown into molds / molds (mold-blown) or free (free-blown).